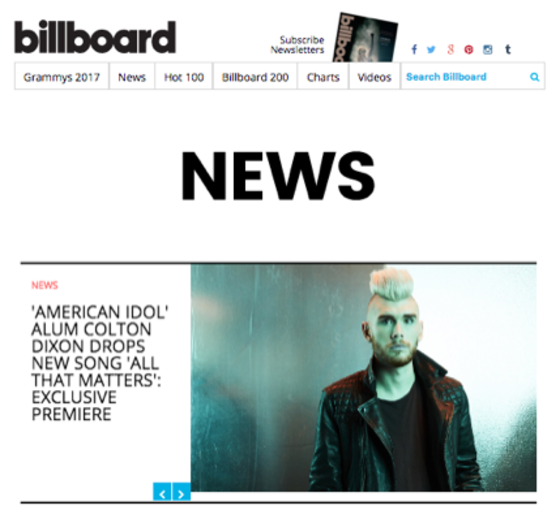 Nashville, Tenn. (January 13, 2017) — Colton Dixon's third studio album Identity is set to release March 24, as announced yesterday on Billboard. Varying stylistically from previous releases, Identity will blend Dixon's traditional alternative-rock sound with pop elements, delivering a number of upbeat, danceable tracks. "I think this is the most fun I've had making an album," Dixon told Billboard, who also exclusively premiered the lyric video for the album's debut single "All That Matters," available for purchase today. At radio now, key stations nationwide are jumping on the single, in addition to an immediate add by K-LOVE. Fans can hear Dixon perform the new single and more on tour with Winter Jam now through April. which featured No. 1 hits "More Of You" and "Through All Of It," and earned a 2015 Dove Award for Rock/Contemporary Album of the Year. Identity pre-order packages are available now.